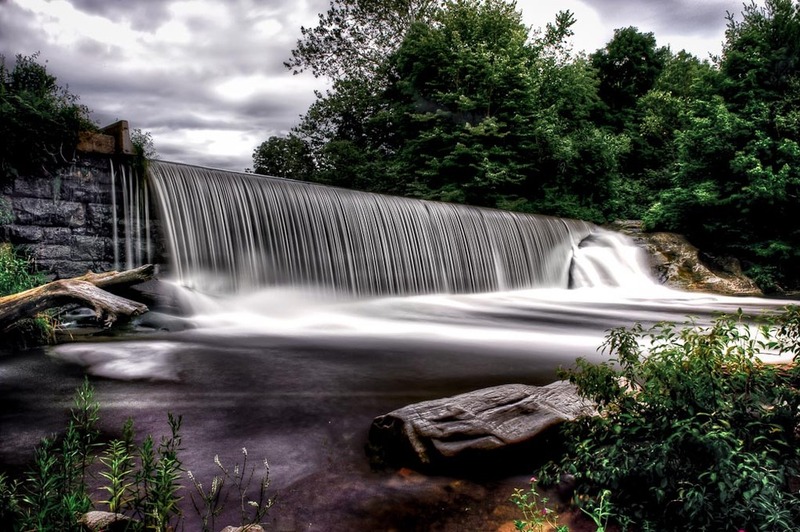 This is an image of Blackberry Falls in East Canaan, Connecticut. It is located at the Beckley Furnace Industrial Monument and is Connecticut's only official Industrial Monument. Built in 1847, the Beckley blast furnace produced iron primarily for the manufacture of railroad car wheels that were known for their excellence and durability. The furnace closed in 1919 and stands today as the best preserved example of a technology that has long since vanished. This particular day, the weather was quite dreary with harsh overhead light. This exposure was made with a neutral density 10-stop filter for 32 seconds. While the result was pretty good for the falls, the surrounding sky and trees were a challenge. As a result, I created a HDR from the image and was able to bring back details into the surrounding areas.